The WEMPE ELEGANCE Series presents the precision instrumentation of the traditional German company in an elegant design. For the exclusive appearance, the three instruments are fixated on a high-quality wooden board which brings out the individual beauty of every single piece. This technical instrument panel can therefore be used as an accessory for your office or living room too. 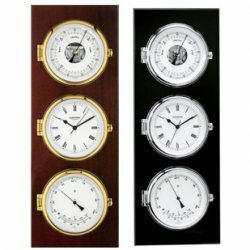 The instruments of the WEMPE ELEGANCE Series are a battery-powered quartz clock with Roman numerals, a barometer with visible movement, and a thermometer/hygrometer combination. The clock face is 140mm in diameter, coloured in white, and printed with black numerals. The version on the mahogany board includes housing of high-gloss polished brass, while the piano black lacquered board is combined with chrome plated housing. Due to their extraordinary looks the WEMPE ELEGANCE Series is a great gift for passionate sailors and supporters of maritime lifestyle.